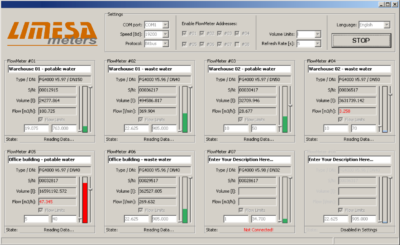 This software is designed for easy storage and printing of the measurement protocol from the readings from the FG4000 flow meters. It is designed primarily for industries such as dairies, breweries, winemaking, production or sale of chemicals, …for industries where there are requirements for recording a quantity of product (delivered milk in tanks, bottling from a beer tanks,…). 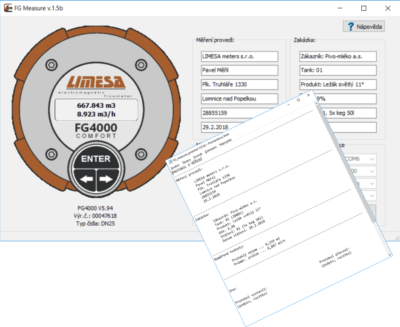 User-friendly and very simple software, allows you to connect one FG4000 flow meter to a PC. When the flow meter is connected, the flow rate, total volume, meter type, serial number, and sensor diameter of the concrete flow meter are displayed on the left side of the application. The right part is reserved for setting up your own measurement log. There are two paragraphs of freely editable text with six lines each. This makes the program’s variability almost unlimited. The actual measurement is controlled by the start, pause and stop buttons. The measurement report is stored in an editable txt format. The user-set text and measurement results are automatically written in the protocol. You can choose whether only the measured volume or even the average flow over the measurement period will be printed on the log. The software enables the connection of one FG4000 to a PC via the RS232 or RS485 interface. The application is mainly designed for surveillance stations. It allows connection and remote monitoring of up to 8 FG4000 meters at the same time. The program displays the current volume, flow, serial number, type and diameter of each connected flow meter. For quick clarity, these values can be optionally visualized using continuous bargraphs. The lower and upper limits of “flow rate” can be set. Flow values between these limits are visualized by the green colored bargraph. The values below the lower limit are visualized in blue color, the values above the upper limit in red color. Every FG4000 flow meter can be named in the program. The software enables the connection of one FG4000 to a PC via the RS232 or up to eight FG4000 via the RS485 interface.